The impact of our Israel trips is not easily observed or measured. Sometimes trees fall in the woods, with no one around to hear them. 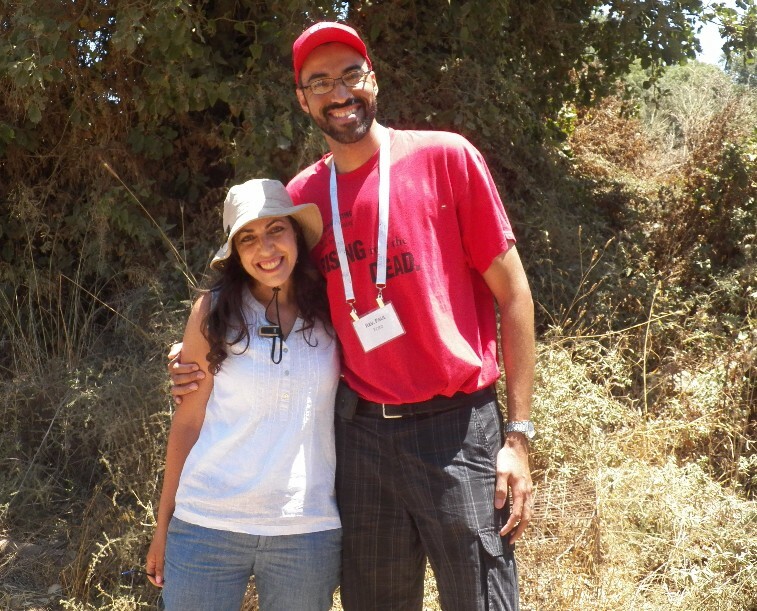 If one of our study tour alumni tells a story to a congregant or a constituent about something they experienced in Israel, we may never hear about it. That is why we were so heartened to read the news out of Springfield earlier this week. Justin Hurst, the Springfield City Council’s new President, traveled with JCRC to Israel in December as part of our Municipal Leaders Study Tour. The speech he delivered at his swearing-in ceremony was largely inspired by his Israel trip, his appreciation of the complexity he encountered, and its connection to his work in Massachusetts. (L-R) Boston City Councilor Kim Janey, Easthampton Mayor Nicole LaChapelle, Springfield City Council President Justin Hurst, and JCRC Board Member Fredie Kay at the swearing-in ceremony. One of our study tour visits is particularly relevant here. Toward the end of our trip, we met with Dr. Thabet Abu Ras, co-director of the Abraham Initiatives (featured as part of our Boston Partners for Peace program). Thabet spoke to us about many of Abraham Initiatives’ programs, including their safe communities and equitable policing initiative. The Abraham Initiatives are working from two directions—with the Israeli police and security services and with Arab communities in Israel—to develop better relationships and safer communities. This includes increasing the representation of Israel’s Arab citizens in the police force, various high-level training programs, and other trust-building initiatives. I wonder whether Justin had that conversation with Thabet in mind when he raised this particular issue during his swearing-in speech. In both Israel and Massachusetts, we witness the often fraught relationship between minority communities and the police. This is a common theme that stretches from Massachusetts to Israel and around the world. In Israel, Justin heard about cutting edge efforts, that are succeeding in ensuring greater representation of minorities on local police forces, and building stronger relationships between law enforcement and the community. Finding common cause with their counterparts in Israel experiences, sharing the challenges they face as municipal leaders, and being inspired by each other’s creative solutions; these are the very sparks we hope to ignite during the study tour experience. But the new relationships and connections don’t end there. Justin was not the only study tour participant present at his swearing-in. Boston City Councilor Kim Janey, Easthampton Mayor Nicole LaChapelle, and JCRC board member Fredie Kay were all there to support him. Not only did Justin make an individual connection between his role in Springfield and his Israel trip, he made connections with the rest of the group that will lay the ground work for new collaborations in the years to come. This brief vignette captures everything we hope to achieve on our study tours: complexity and connection. We introduce people to the complexities in Israel—some of which are unique to Israel, while others resonate deeply with participants’ own experiences back home. This creates the opportunity for deep and meaningful connection; we can learn lessons from the Israeli experience that help inform our lives in Massachusetts and can share our own insights with our friends there. I was thrilled to see both complexity and connection at play in Springfield this week. Seemingly every #JCRCinIsrael Study Tour centers around one major news story. Last winter, we left for Israel just after President Trump announced that the US would recognize Jerusalem as Israel’s capital and move the Embassy there. Over the summer, we had many conversations about Israel’s nation-state law, which had recently passed in the Knesset. But this time, our group of 11 municipal leaders from around the Commonwealth had the luxury of experiencing Israel without one emerging news story dominating our discussions. Our speakers were able to step back and highlight some of the long-term tensions that give rise to the region’s complexity. During our time in Israel, our group came to understand that failing to appreciate this complexity is one of the central dynamics perpetuating the Israeli-Palestinian conflict. During our time in Jerusalem, we went on a tour with Danny Tirza. A retired IDF colonel, Danni is the chief architect behind what he calls Israel’s “security fence.” He brought us to two stops: first to the East Jerusalem neighborhood of Gilo, and then to see a checkpoint near Rachel’s Tomb where Palestinians enter Israel from the West Bank. Danny told us about the steps that he took to balance Israel’s security concerns with the potential for humiliation that the security fence would cause Palestinians. Most of us left our time with Danny believing that he did his best to minimize the daily impact that Israel’s security apparatus has on Palestinians. The next day we sat with peace activists from the Roots program including Noor Awad, a Palestinian who grew up in Bethlehem in Area A of the West Bank. Noor told us that growing up, his family would visit the beaches of Tel Aviv and Jaffa on weekends, until the “separation wall” (i.e. Danny’s “security fence”) made that an impossibility. He now feels stuck, lacking the basic freedom of movement that he once had. Despite Danny’s best efforts to reduce these feelings, they are still the reality for Noor and many others in his community. Later in the week we spent time visiting a moshav near the Gaza Strip. We sat in a bomb shelter underneath a children’s playground as our hosts showed us a mortar that had been fired into the community from Gaza. Our participants were surprised to hear that there are no drills in this community that help children learn to seek shelter, since the threat they face is not a theoretical one where survival might be aided by advance preparation. The constant firing from Gaza into Israel means that everyone knows to run to shelter when they hear the Red Alert siren, even if they do not fully understand the danger. Many of us were also thinking about the children living only a few minutes away in Gaza. They too deal with the violence plaguing this area, but no one is requiring bomb shelters to be built for them. The fact that Israel places such higher value on human life and the protection of its people than the Hamas government in Gaza only compounds the trauma faced by innocent families in Gaza amid one of the worst humanitarian crises on the planet. These stories underscore a troubling reality. For many Israelis and Palestinians, the peace process has brought them further from peace. We heard from many of our speakers that regardless of their personal narratives, they feel deep pain at the lack of basic interaction between Jews and Palestinians. On our last day in Jerusalem one of our participants asked how these opposing narratives can be reconciled to create a coherent whole. I responded by saying that the goal is not to create one unified narrative, but rather to recognize the validity of the other’s narrative. This is the most important step of the Israeli-Palestinian peacebuilding process, and it is why our first Pages for Peace book club will be reading The Lemon Tree in 2019 (young adults 22-40 can sign up here to join a group in Cambridge/Somerville, Brookline, or Jamaica Plain). To be allies to those working every day for peace, we must sit with competing and sometimes uncomfortable truths. The Israeli-Palestinian conflict should not be viewed as black and white, and it takes openness and humility to live in the gray area. What impressed me most this week was the ability of so many people to do just that. As JCRC’s latest civic leaders study tour arrives in Israel today, this one led by Boston City Council President Andrea Campbell, I am both proud and envious to not be joining them. I’m proud because this is the first time in seven years that I’m not traveling with JCRC’s winter study tour and my absence is a reflection of our success in implementing our strategic vision. We’ve developed a cadre of professionals – led by our Director of Israel Engagement, Eli Cohn-Postell – that allows us to reach more civic leaders and connect them with Israel. The fact that this work is no longer dependent on the presence of the executive director is an indication of our enhanced capacity to deliver these vital programs. Support our Israel Engagement work! If you give by December 31st, you’ll double your impact through our Year-End $10,000 Challenge Match. And I’m envious, because this past week, I’ve been reminded of how enriching I find these trips, with their ongoing discussion of complex and complicated issues: conversations which are all too absent from our daily political discourse. Two events in particular have drawn my attention. The first is the controversy over Airbnb’s decision to delist properties in Jewish communities in the West Bank beyond the 1948 armistice line between Israel and Jordan – aka the “Green Line,” though not in East Jerusalem. The second involves aspects of the commemoration of the life of President George H.W. Bush. In the reaction to Airbnb’s decision, there has been a fair amount of hyperbole for partisan purposes: Anti-Israel activists have wrongly claimed that a boycott narrowly targeting homes in “settlements” is a victory for their movement, equating this with boycotts of Israel “proper.” In fact, many people, including us at JCRC, differentiate between these actions. We oppose boycotts of Israel, and, while we don’t support boycotts of West Bank products, we do not believe that they inherently constitute a form of anti-Semitism. This level of hyperbole indicates a lack of complexity: Supporters of Israel were right to be angry that Airbnb adopted, for now, a policy about one conflict zone that they chose not to adopt equally for all conflict zones. At the same time, it’s important to note that in effect, Airbnb merely made the same differentiation that Israel’s own government makes; distinguishing in practice between Israel “proper” (i.e. areas under Israeli sovereignty since 1948 and those areas in Jerusalem and the Golan Heights that have been formally annexed by Israel and live under Israeli civil authority) and Jewish communities in Area C of the Oslo Accords that have a temporary status until a final peace agreement is reached. And then, regarding our public mourning for President Bush, I experienced several moments when people expressed flattering thoughts about Bush and his legacy – “decent,” “dignified,” “a statesman,” – and were then hammered for these expressions. Once again, there was a failure to acknowledge complexity, or to hold multiple and potentially competing truths at once. President Bush was both an ally and sometimes an opponent of various Jewish concerns, a transformational advocate for the disabled and yet also seemingly indifferent to the impact of the AIDS epidemic, a decent man whose campaign in 1988 was one of the nastiest in memory (at least at that time). Complexity and nuance. Too often lost in our hurried and overblown rhetoric, our outrage-of-the-day, our tribalist “with me or against me” politics in a 280-characters-or-less world. Lost is the nuance and complexity, like the kind we offer on our study tours when we slow down and spend time over the course of a week hearing multiple and conflicting narratives from as many corners of Israeli, and Palestinian, society as we can expose ourselves to. We seldom make the space for the kind of interesting discourse that happens when we actually sit with someone and get to see them as a person with a life and experiences different from our own. It’s in that space that generative ideas can emerge and real learning can take place, all of which I am envious to miss this week. (BOSTON) – The Jewish Community Relations Council (JCRC) of Greater Boston continues its long history of leading Massachusetts community leaders on a study tour of Israel, this month providing MA municipal leaders with an in-depth look into the economic, political, and security challenges and successes facing Israeli society. From December 7-15, Massachusetts municipal leaders will travel throughout Israel, learning from government officials and religious, academic, media, and business leaders. “This trip will allow Massachusetts leaders to deepen their understanding of Israel's politics and culture, and examine some of the economic ties that bring Israel and Massachusetts together,” said Jeremy Burton, Executive Director of JCRC of Greater Boston. “The best way to deepen the MA/Israel connection is through a mutual understanding of our common interests—participants will gain firsthand knowledge about how they can strengthen relationships with their Israeli counterparts." Visit Jerusalem, Tel Aviv, border regions, and the Palestinian Areas. Encounter Israel’s innovative economy, including its booming research, development, and tech sector. The trip is being paid with a grant from the nonprofit Combined Jewish Philanthropies of Greater Boston. Participants pay a registration fee for the trip from their own funds. JCRC defines and advances the values, interests, and priorities of the organized Jewish community of Greater Boston in the public square. Visit us at www.jcrcboston.org. There is a rabbinic idea that there are 70 faces of the Torah, each containing its own bit of truth about the world. This Talmudic theory was explained to me at the Shalom Hartman Institute in Jerusalem earlier this week, one of the stops on JCRC’s recent Christian clergy study tour to Israel. Our group was composed of 13 local clergy members and two trip co-chairs: Revered Kathleen Reed of University Lutheran Church and Rabbi David Lerner from Temple Emunah. Throughout our week we experienced what felt like 70 different faces of Israel, each with its own piece of truth that we were left to puzzle together into a coherent whole. I am returning from the trip with a renewed sense of conviction regarding JCRC’s Israel engagement work. Our conversations in Israel were marked by two prevailing themes—ideas that mirror our priorities for how we engage with Israel here in Boston. First, we experienced the complexity of Israel, always moving ourselves from black and white answers into the muddled, gray, middle area. We also heard repeatedly from both Israelis and Palestinians about the power of investing in bottom-up, grassroots peacemaking efforts. Israel remains a confounding place for many of us. How can so much good be mixed with so much that raises uncomfortable questions? Our group was inspired by programs that lift up the voices of those most in need. We learned about the way Sindyanna of the Galilee, a female-led non-profit that sells fair trade olive oil, is changing cultural norms by providing new economic opportunities for Arab women. We were equally moved by the work done at Yemin Orde Youth Village, a home to 440 at-risk and immigrant youth from around the world, and their philosophy of education and life that spurs growth in every individual they work with. When we arrived in Jerusalem in time for the LGBTQ Pride march, many of us joined in the celebration. We were able to visit a community on the border with Gaza and what seemed like calm on Monday had turned into rocket attacks by the time we returned home Tuesday. We also had the opportunity to dive into programs working on reconciliation, co-existence, and recognition of the other. Our participants were excited to learn about JCRC and CJP’s Boston Partners for Peace initiative, and we had the opportunity to learn about partner organizations including Givat Haviva, Hand in Hand schools, Women Wage Peace, and the Parents Circle Families Forum. The work of the Parents Circle, which is a group of Israeli and Palestinian families who have lost loved ones to the violence, resonated with our group. This was thanks in part to the connection between their work and that done by one of our participants, Chaplain Clementina Chèry. She is the founding Director of the Louis D. Brown Peace Institute, a center of healing and learning for grieving families and communities. We look forward to co-hosting a delegation of bereaved families from the Parents Circle in Boston next month. On the other hand, we could not avoid the problem areas embedded in Israel’s social fabric. The Palestinian speakers we met with expressed grave concerns about Israel’s new nation-state law, stating clearly their view that they are now de jure second-class citizens. We also heard from an asylum seeker from Darfur about the struggles he faces trying to balance opportunity in Israel with his fear of returning home and the challenges of navigating the Israeli bureaucracy. The topic of race came up frequently on our trip, and unfortunately two of our African American participants experienced troubling racial incidents during our tour of Jerusalem’s Old City. These incidents were all the more perplexing since it seems they were instigated by Palestinians, a group that many of our African American participants felt a strong kinship with throughout the rest of the trip. All of this was summed up by a phrase one of our participants coined to describe Israel: profound normal. Israel is a normal country, grappling with issues of democracy, discrimination, and immigration while also making powerful contributions to global issues and being a regional leader in the areas of inclusion and human rights. At the same time, this normalcy is profound—the issues we care about in Israel are the same as those we want to see progress on in America and the rest of the world. Where we might expect there to be difference we instead find similarity. I know that we in Boston are on the right path. We are creating a model for Diaspora engagement with Israel that isn’t afraid of the complexity, and that takes the time to listen to our partners so that we can help create a peaceful future for Israelis and Palestinians. We create initiatives like Boston Partners for Peace not because we want to dictate the best path for Israelis and Palestinians, but because our ears are open to their needs. 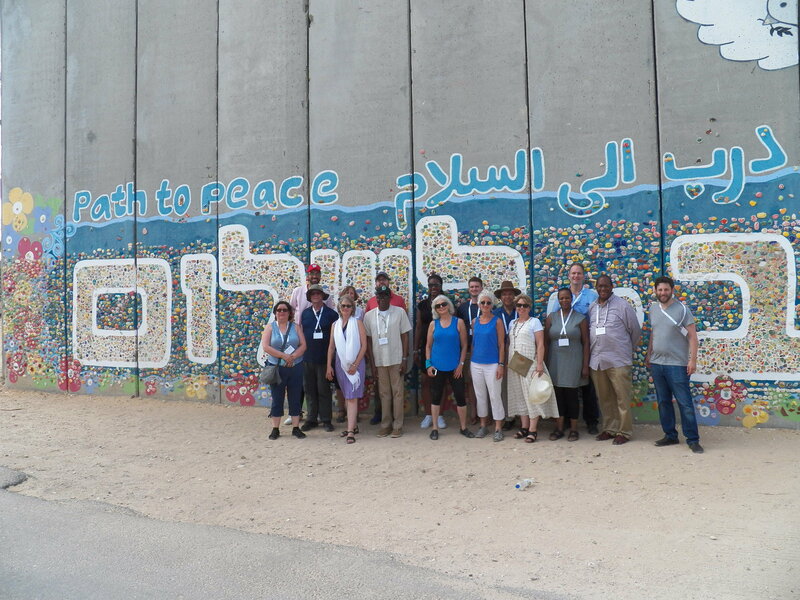 And every few months our study tour programs for clergy and civic leaders introduce new changemakers to these partners and help to spread their message: the hope that peace can happen. I spent last week in Jerusalem, Bethlehem, and Ramallah as a facilitator for Encounter, following my experience as a participant last year. This time, my role was to support other American Jewish leaders who were there to listen and learn from Palestinians about their lives and experiences. I also had the opportunity to spend a few days touring in Jerusalem, with the ground partners we work with on our civic leader study tours, exploring new (to us) ways to engage. Three “moments” that I would not have imagined possible only a few years ago have stuck with me as I returned home. They feature extraordinary women representing vastly different communities, but pursuing common goals with relentless determination and unimaginable courage. With JCRC’s ground partners on Mount Zion, just outside the Old City walls, at the Jerusalem Intercultural Center, I learn about current efforts by Palestinian Jerusalemite women (the vast majority of whom are not citizens of Israel) to organize and agitate for basic municipal services. Since they refuse to recognize Israeli sovereignty, this community has been engaging in a 50-year-long boycott of municipal elections. One result has been their lack of representation at City Hall, leading to, among other things, chronic problems with services like street-light repair and garbage pickup. For decades, these issues were taken up by the clan leaders, the men in their communities – to little effect. But in recent years, the women have taken matters into their own hands, organizing, and even building coalitions with Orthodox and secular women in Jewish communities of the city. Their efforts are bearing fruit, including increases in budgets for services that are improving the quality of life in their communities. Women, we are told, are getting the job done. In Geula, a Haredi neighborhood of Jerusalem – a place I knew well when I was a black-hat yeshiva student living in that city in the 1980’s – a Hasidic woman leads us on a professional walking tour. She tells us about her own journey from 18-year-old married mother to a later-in-life college degree and profession. She engages us in an open and profoundly candid conversation – one I would never have imagined having with a woman from this community even 10 years ago – about social change and social issues in her community; women’s health education including birth control, LGBT issues, debates over higher education, etc. My friend asks her if she will have any issues walking on the streets with obviously outsider men (let alone any man other than her husband). “Things are changing. My neighbors understand the importance of what I am doing. This corner is fine,” she replies. Then in Bethlehem, now having joined the Encounter group, I meet a Muslim woman who is involved in Women Wage Peace – a group of Israeli and Palestinian women working through non-violent means to build grassroots pressure on the political leadership in support of peace. This woman (names are protected because not all the people I met were on the record) tells us about her own journey and her determined efforts to teach her neighbors and youth in her community to see The Other – the Israeli, the Jew – as fully human, and to appreciate the feelings they have, that are common to us all. She has brought her teenage son with her to this meeting with American Jewish leaders. He sits quietly next to her. At one point, as she tells her story, she talks about the first intifada in the 1980’s, when she was in college and I was a post-high school yeshiva student just down the road in Jerusalem. She did what all her classmates did: threw stones at the Jews. Jews like me, a mile away, I think to myself. And, as she tells this story, she reaches out and gently places her left hand on her son’s knee; only for a moment, while talking about her own violent past. And she doesn’t touch him again for the hour we are together. I feel the message in that moment and in this boy’s presence in the room: She’s telling this story as a mistake she prays he does not repeat. She’s brought him here to see that her choice, to pursue non-violence as a practice, is a better one, and one that opens up doors of access to her, that brings her voice and vision before us visitors. It is a choice that needs validation and support. And over our time in Palestinian areas, we hear other activists who practice non-violence tell us that they need “wins.” Victories to show their neighbors that their approach works, that violence is not the path to a better future. I come away appreciating that change is possible and continuing to happen. But that change never happens on its own. It takes bold vision and profound courage. And it needs our support; to amplify the visibility of activists, to celebrate and give strength to those pursuing non-violent social change. I’m proud that Women Wage Peace is one of the initial participants in the Boston Partners for Peace, our effort to amplify and connect with changemakers on the ground who are bridging the Israeli and Palestinian communities and paving the way to a better future. We can have an impact in supporting the future of this place that continues to evolve before our eyes – only if we take the time to listen, to learn, to be inspired. But we must also act now, for we know that this possibility can be fleeting, and nothing is guaranteed to last forever. The question I ask myself is: What will these neighborhoods and communities will look like in another ten years, and how can our community be a part of cementing their progress long into the future? A short while ago, I arrived in Israel. Joined by our director of Israel Engagement, Eli Cohn-Postell, and two of our board members, Alex Goldstein and Leah Robbins, I am privileged to be leading our annual winter study tour for Massachusetts legislators. Two Massachusetts Senators - Joseph Boncore and Patrick O’Connor - and eleven Representatives - Linda Dean Campbell, Evandro Carvalho, Gerard Cassidy, Kenneth Gordon, Danielle Gregoire, David Muradian, Jerald Parisella, Jeffrey Sanchez, Alan Silvia, Chynah Tyler and RoseLee Vincent - will be spending the next nine days experiencing the region and learning about the challenges and hopes of this place that is so near and dear to all of us. First is that, with each group, I get to experience this place I care so deeply about through fresh eyes. It’s amazing to encounter Israel and my own deep connection to our roots through the lens of someone who is seeing it for the first time. And, I get to witness as our participants fall in love with the leaders and activists who’ve inspired and energized me for years. Second, I am confident that - as on every trip - this week, I will meet at least one interesting person here for the first time. Maybe he will excite me or, just as likely, she will challenge my thinking and understanding. But one way or another, I’ll come away with another layer, another story, another example of how – after thirty-one years since I first lived here and after visiting countless times since – I still have so much to learn about this place. Finally, while every trip examines long-existing challenges and the layers of this region, each also presents the opportunity to come face-to-face with a unique moment and get a fresh perspective on how people here are grappling with and talking about the latest developments. This week, it goes without saying, that news is Jerusalem and the United States government’s view of this most ancient city and Israel’s capital. Those “in the news” moments will inevitably bring us back to the enduring conversations we’ve been having for years. How do different people and stakeholders define “Jerusalem?” What does this place mean to us, and to others? How is Jerusalem an issue and where does it sit relative to other matters that come up as part of the discussion about achieving peace and a two-state solution for Israelis and Palestinians? Which is to say that for folks who are here for the first time and challenging their understanding of this place in a new way, the conversation will transcend the current moment and news cycle. We will begin a broader conversation that will hopefully be an enduring one, as they continue to follow events and deepen their understanding in six months or six years. So yes, it has been JCRC’s incredible privilege to bring so many members of the Massachusetts legislature - as well as dozens of clergy and other civic leaders - to Israel over the years. I am profoundly grateful to have the opportunity and the donor support that allows us to be here. This experience never fails to energize and inspire me. It will, I am confident, renew and strengthen my own commitment to all that we do back home in Boston to engage with Israel and to work in support of those here whose hopes and aspirations we share - for two people, Israelis and Palestinians, living in peace in two states sharing one homeland. I hope over the coming weeks you’ll follow our journey on social media and I look forward to sharing more about our impressions when we return. Three weeks ago, JCRC’s latest Christian Clergy Study Tour set out on our journey to Israel. The group comprised thirteen Protestant clergy members from across racial, socioeconomic, denominational and theological lines. Co-chaired by Rabbi Elaine Zecher of Temple Israel of Boston and JCRC trip alum Reverend Kent French of United Parish of Brookline, our group members were African American, West Indian, Latino, and White; Presbyterian, African Methodist Episcopal, Baptist, Lutheran, Pentecostal, and from the United Church of Christ. Our ages spanned from 20’s to 60's. Most had never been to Israel, and the few who had were there many years earlier, generally with little exposure to the Jewish-Israeli narrative. The group was united by a passion for an encounter with the land of their Scriptures, a thirst for engaging with complex realities and conflicting narratives, and, perhaps most of all, a deep desire to emerge with a sense of hope for the region’s future. On our first morning, we set aside our jet lag to hear a presentation by veteran journalist Nathan Jeffay, who shared his experience covering Israel for multiple media outlets, including New York’s Jewish Week and London’s Jewish Chronicle. Jeffay told us that over his years of reporting, his editors’ directives had been consistent: stories of conflict and violence were always of most interest to readers, and each piece should include no more than two or three ideas at most. He cautioned the group to keep that in mind when consuming media pieces about Israel. Reading stories from afar would never result in the kind of multi-textured and nuanced understanding that is possible through direct encounters. Jeffay’s message rang with wisdom and truth throughout our trip, as we were exposed daily to a multiplicity of ideas and perspectives and learned of exciting initiatives on the ground to build a better future for Israelis and Palestinians. A moment early on in our trip continued to resonate powerfully throughout. We visited the Lebanon border with IDF Major (Ret.) Sarit Zehavi, a former senior intelligence officer responsible for preventing collateral damage to Lebanese civilians. We peered into nearby Lebanon and noticed a large Hezbollah flag in full view. Our veteran Israeli tour guide who visits this site regularly shared his unease at this new addition. Major Zehavi offered her no-nonsense Israeli perspective; that the only way to achieve peace is through demonstrating military strength and readiness for aggression when necessary. One of our pastors engaged her in a robust debate, respectfully challenging her assertion. But before we left, he asked whether she would permit him to offer a prayer on her behalf, so we joined hands as he led us in a fervent prayer, asking for peace and security for her, her family living just miles from this place, for the people in Galilee and those on the other side of the border. We visited the dusty tent of a fledgling NGO called “Roots” in Gush Etzion (above). 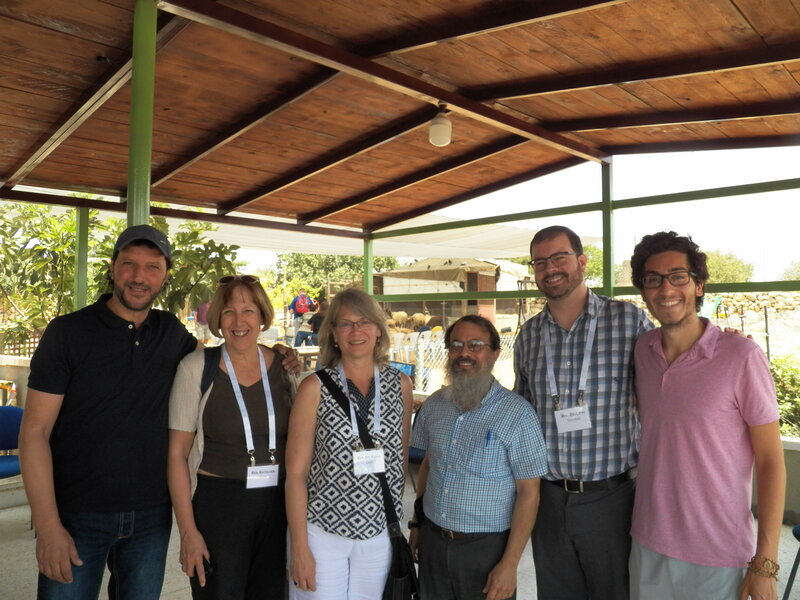 There we met with Rabbi Hanan Schlesinger (third from right), who co-leads this organization, promoting Israeli-Palestinian understanding and mutual recognition, along with his Palestinian partner, Ali Abu Awad (far left). Rabbi Schlesinger identifies as a Zionist and settler, and believes that the Jewish people is fulfilling God’s promise by renewing its age-old tie to the Biblical land of Israel. But he shamefully acknowledged that the truth and righteousness of his story had blinded him most of his life to another story and another truth. With great passion, he described the transformation he experienced once he got to know his Palestinian neighbors, and he began to understand their experience of living in the same land, but under occupation. Ali described the multiple traumas that he and his family suffered, including the death of his brother, who was fatally shot in an argument with an Israeli soldier. When Jewish members of the Parents Circle reached out to his bereaved family and came to pay their respects, for the first time Ali saw Israelis not as his enemy, but as people whose tears of grief were no different than his own. He committed to a life of non-violence and to working with those whose partnership would be most essential for peace; not liberals drinking lattes in Tel Aviv, but the settlers who were his neighbors. The courageous leadership and stubborn optimism of Hanan and Ali left lasting impressions on our group. Finally, we traveled south to Moshav Netiv Ha’asarah (above), right along the Gaza Border. We heard from Susan, a veteran community member who moved there decades ago, motivated by her idealistic vision of working the land in a close knit Jewish community. Since the 2005 Israeli withdrawal from Gaza and the subsequent Hamas takeover, her community has found themselves subject to frequent attacks. Now, along with trying to sustain a thriving farming community, they have had to prioritize security concerns, constructing ever more sophisticated shelters and rerouting their school bus to avoid being targeted by rocket and mortar fire. And yet, the change that they lament perhaps the most is the disconnect from their neighbors in Gaza with whom they once had frequent contact. When one of our ministers asked whether they were still in touch, Susan said that they were, through periodic phone conversations. Though they are careful about the information they transmit, they still care about each other and know that the connection they share is much more powerful than all that divides them; the universal human desire to provide good lives for their families and live in peace. The mantra repeated throughout all of our study tours is that participants can expect to go home with even more questions than they came with. Once again, that was the experience of this cohort, as they acknowledged the complexity they encountered, one that defied black-and-white thinking and oversimplification. As Jeffay predicted, our engaging directly with the land and its people offered far more than the ideas available in the press, or a picture limited to conflict and violence. And yet, despite the diversity of our encounters and the vast differences in background and ideology among those we met, binding them together was their shared humanity and collective aspiration to live in peace. These Israeli and Palestinian change-makers now have thirteen American faith leaders who will be praying passionately for that to be so. A short while ago, I arrived in Israel. Joined by our trip chair Representative Lori Ehrlich of Marblehead, and by JCRC board members Beth Badik and Ben Pearlman, I am privileged to be leading our annual winter study tour for Massachusetts legislators. Twelve state representatives will be spending the next nine days experiencing Israel and the region while learning about the challenges and hopes of this place that is so near and dear to all of us. After five winters leading these trips, and having accompanied almost one third of the Massachusetts legislature to Israel during this time, you might think I’d get a bit jaded. And it’s true, I’ve spent more time in churches in Jerusalem than I ever expected to when I lived there as a yeshiva boy. I’ve visited the Dead Sea far more than this ‘once in a lifetime’ experience requires. First, with each group, I get a fresh chance to see a place I care about so deeply. It’s amazing to encounter Tel Aviv through the lens of someone who is seeing it for the first time. It is always a privilege for me to deepen my own connection to our history when travelling with someone who has never been there before. And, I get to watch firsthand as our participants fall in love with the leaders and activists who’ve inspired and energized me for years. Second, while every trip examines long-existing challenges and the layers of history in this region, each also presents the opportunity to come face-to-face with a unique moment and get a fresh perspective on how people here are grappling with and talking about the latest developments. We’ve all been following the terrible fires this past week, especially as they’ve impacted our beloved sister community in Haifa (and if you haven’t already, please join me in supporting CJP’s emergency relief campaign). I’m looking forward to getting back there next week to see and support our friends and to connect our travelers with our long-term partners. We’re also coming here for the first time since our own elections. And, while I’ve said a lot these past few weeks about what this election means for our domestic priorities, here is the opportunity for all of us on this bus to learn how Israelis and Palestinians are reacting to our outcome. We’ll hear from strategic thinkers with their views on U.S. engagement both in our role as ally to Israel and also as a larger actor in the region. We’ll want to know their take on the shifting U.S.- Russia relationship, their insight regarding Russia’s client regime in Syria – which is also backed by Iran’s regime; and what this all means for Israel just days after an IDF encounter with ISIS in the Golan Heights. So yes, it has been JCRC’s incredible privilege to bring so many members of the Massachusetts legislature - as well as dozens of other clergy and civic leaders - to Israel over the past five years. I am profoundly grateful to have the opportunity and the donor support that allows us to be here. This experience never fails to energize and inspire me. It will, I am confident, renew and strengthen my own commitment to all that we do both on the ground in Israel and back home in Boston.